National Endowmentfor the Arts Chairman Rocco Landesman announced his retirement effective at the end of the year -- but not without first publishing the NEA 2013 Challenge America Grants, a Holiday/Christmas Gift to America that rewards the participation in the arts by people who help make communities thrive. 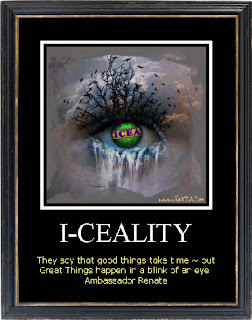 Iceality is the measure of the connection between arts, civic engagement and the environment, which can be defined as promoting a positive and peaceful quality of life for the people. 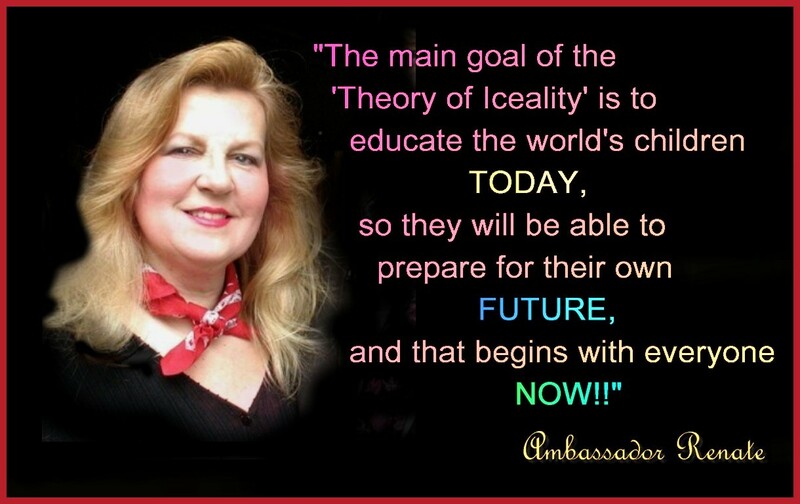 The ‘Theory of Iceality’ is the understanding of the relationship between Humans and their Environment through the Arts ultimately promoting a sustainable global ‘Culture of Peace’. 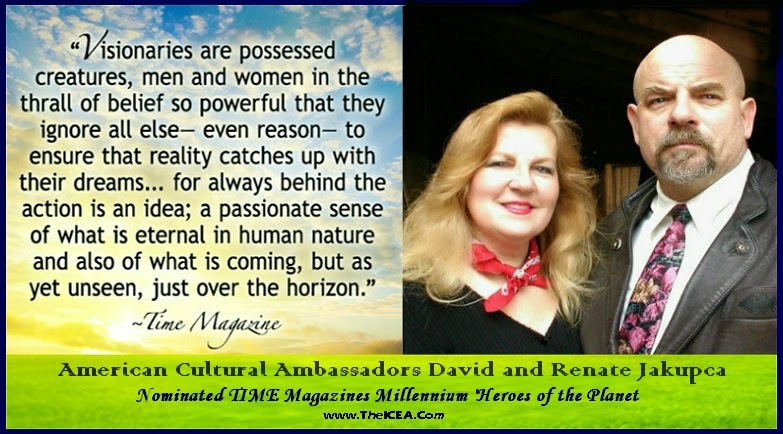 David and Renate Jakupca, American Cultural Ambassadors and Co-Founders of the International Center for EnvironmentalArts (ICEA), give a brief historical background of the purpose of establishing the leadership center that has been connecting Art and Culture to the urban habitat, human rights and the environment for the past 25 years. 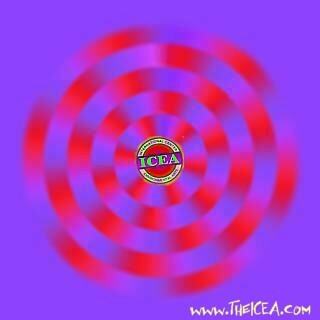 ICEA was founded in 1987 to meet the compelling needs of ordinary citizens for access to current, balanced, understandable information about complex global issues. In 1996, ICEA, as an affiliate center of Earth Island Institute, exhibited work from Cleveland’s Whiskey Island Lakefront at Habitat II, the UN Conference on Cities in Istanbul, Turkey, and was facilitating a continuing dialogue among member nations. This information was also sent and acknowledged by NEA Chairwoman Jane Alexander for the NEA American Canvas Project in 1997. The American Canvas Project is used in all 50 Districts of the NEA including Ohio, and in Cleveland Tom Schorgl, President of Cuyahoga Arts and Culture ( Partnership for Arts and Culture ) reported in the media that he has used The American Canvas Project extensively in his organization. 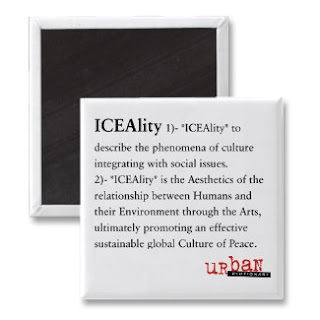 The 2013 NEA Grants are for Spaces Gallery and Cleveland Public Theater (CPT), CPT used the definition of Iceality verbatim in it’s The Elements Cycle application! Ambassador Renate notes that, ICEA was originally geared towards creating an international learning community, supported by students, families, community members, teachers, administrators and civil society organizations with the philosophy of iceality, an umbrella structure for all organizations that is deeply-rooted in the unique history, culture and ecology of North East Ohio. David Jakupca praised ICEA’s past 25 year collaboration between the United Nations and their various global multi-cultural partners in the role of "building bridges", both within the Cleveland community, as well as between America and the rest of the world. “ICEA has been the gateway for cultural dialogue and experimentation and we constantly try to introduce fresh ideas and new talents into the disciplines of art and design in terms of the creativity they demand relative to the meaning they have for people and their impact on society. "Collaboration and teaming occurred in essentially all aspects of ICEA’s Projects," he said. "The Worlds Children PeaceMonument (WCPM) and the 'Great American Peace Trail' , in particular, has been very much a “cultural industry” enterprise about creating connections between people where the whole is greater than the sum of the separate parts. This generation will play a critical role in addressing the ecological and humanitarian policy challenges for a sustainable global Culture of Peace.” Jakupca adds. “It's hard to imagine a better Christmas gift than one that can give to the Worlds Children and their Families than peace of mind. I appreciate NEA Chairman Rocco Landesman willingness to help people that he will never meet. And on their behalf, thank you.” says Ambassador Renate. During years of leadership and resistance against the British colonization of the Indian subcontinent, Mahatma Gandhi's beliefs never wavered on nonviolence. 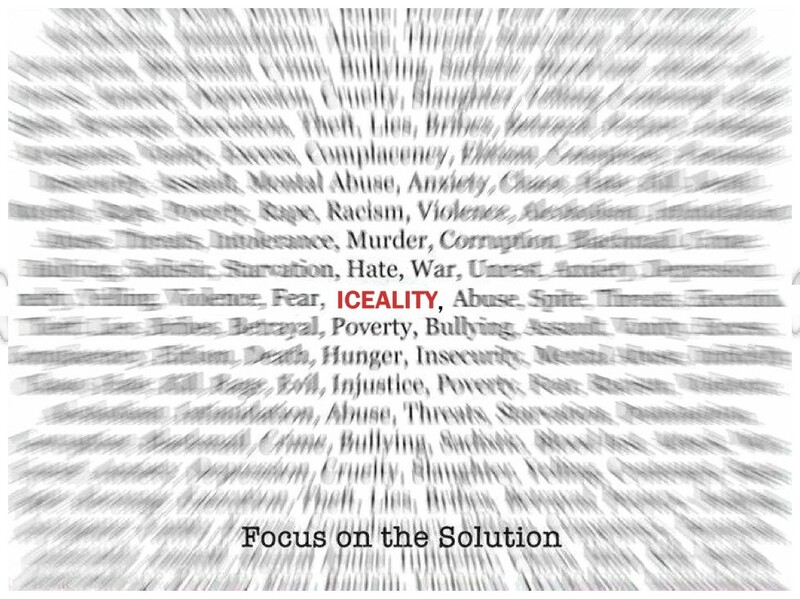 Gandhi's philosophy on nonviolence was his trademark: "Nonviolence is the greatest force at the disposal of mankind. 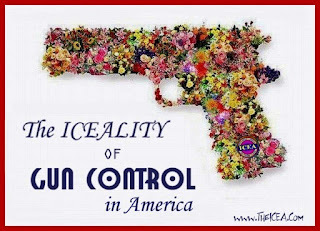 It is mightier than the mightiest weapon of destruction devised by the ingenuity of man." He stood firm in his beliefs on nonviolent protest (i.e., passive resistance including hunger strikes) and religious tolerance. When Hindus and Muslims committed acts of violence, whether against the ruling British (or against each other), he fasted until the fighting would cease. He was imprisoned many years for treason against the British Crown. Well-versed in yoga and meditation, he used his mind to not only endure, but conquer his imprisonment. Starved for extensive periods of food, drink and human companionship, he learned to stay alive and not give in. The British, in a struggle to hold on to a valuable colony, wanted him to publicly recant his beliefs in the cause of Indian freedom and cease his resistance efforts. The British finally relented (in 1947), not to a military victory, but over-overwhelmingly to a triumph of the human will. Subsequently with independence, the countries of India and Pakistan were born--with Gandhi emerging as a hero and father of a new Indian Nation. Nelson Mandela spent most of his life as a prisoner of the government of White-apartheid South Africa for acts of sabotage and treason (the usual reaction of an occupier to dissent). He often gazed at the ceiling of his cell and imagined tropical islands and women among the paint splotches and cracks. Such things occupied his mind and retained his sanity. Many hunger strikes and silent days blended into a 30-year ordeal of imprisonment. Times changed and the overriding bloodbath of whites vs. blacks never occurred as cooler heads on both sides prevailed. Mandela was released in 1990 and went on to assume the presidency of a new biracial republic. Mandela's accomplishment of reconciling whites and blacks in one of history's most cruelly divided nations is a phenomena of almost miraculous success. President of the Arab Republic of Egypt 1970-1981. Sadat was a man of great vision. He laid a foundation for peace in 1977 when he paid a historic visit to Jerusalem; paving the way for Egyptian-Israeli negotiations which culminated in the Camp David framework for peace in the Middle East in 1978. This framework led to the 1979 Egyptian-Israeli peace treaty by the virtue of which Israel withdrew from Sinai to begin the establishment of peace in the region. The two countries then established diplomatic relations in 1982. Killed by an assassin's bullet, all can agree that the Middle East and the world need more great leaders like President Mohamed Anwar El- Sadat. Jimmy Carter Thirty-ninth president of the United States, served as president from January 20, 1977 to January 20, 1981. He championed human rights throughout the world. Significant foreign policy accomplishments of his administration included the Panama Canal treaties, the Camp David Accords, the treaty of peace between Egypt and Israel, the SALT II treaty with the Soviet Union, and the establishment of U.S. diplomatic relations with the People's Republic of China. In 1982 he founded The Carter Center. Actively a nonprofit Center that addresses national and international issues of public policy. Carter Center fellows, associates, and staff join with President Carter in efforts to resolve conflict, promote democracy, protect human rights, and prevent disease and other afflictions. President Carter and The Carter Center have engaged in conflict mediation in Ethiopia and Eritrea (1989), North Korea (1994), Liberia (1994), Haiti (1994), Bosnia (1994), Sudan (1995), the Great Lakes region of Africa (1995-96), Sudan and Uganda (1999), and Venezuela (2002-2003). Through the Global 2000 program, the Center advances health and agriculture in the developing world. In September 1978, Leonard Brezhnev, head of the Soviet Union, made a minor decision that would start a fundamental shift in the history of the world. Brezhnev's careful compromise in appointing Mikhail Gorbachev to the governing Central Committee would eventually lead to the peaceful break-up of the Soviet Union, ending the Cold War. Gorbachev, unknown at the time, was very different from his "old guard" peers on the Committee. Gorbachev was young, energetic, and an idealist. The political structure of the Soviet Union was the result of the influence of Joseph Stalin. Stalin took the political system unleashed by the communist revolution of 1917 and turned it into a killing machine built on a political system of socialist conformity. Stalin's firm hand suppressing the people survived his death. The breakup of the Soviet Union and the release of the Eastern Bloc countries were inevitable--given the economic failure of the Soviet system in the 1970's and early 80's. The Soviets had fallen far behind the West in economic development. Gorbachev had absolute power because he was the supreme leader of the Soviet Union and Communist Party. He had a great desire to reach the common people and have a dialogue with them. He realized that "Perestroika", the process of change, must be started from above--but the common people must be taught about democracy. Gorbachev went through towns and villages carrying his message of change. He promoted idealists like himself to the higher levels of government. One of these idealists was Boris Yelsin who went on to initiate Russia into democracy and lead the early Russian Republic. Gorbachev guided the Soviet Union and the release of the Eastern Bloc countries through a bloodless transition from communism to democracy. This massive achievement qualifies Mikhail Gorbachev as one of the greatest peacemakers of the 20th Century. The efforts of Lech Walesa, leader of Polish Solidarity (the early union movement in communist Poland), culminated in the achievement of the "Gdansk Agreement" (ratified October 9, 1980) which prepared the way for the Solidarity movement's legalization. Walesa accomplished this through leadership, organizational abilities and a series of "illegal" labor strikes. However, the following December, the Solidarity movement was crushed by the communist Polish militia and Walesa (and others from the movement) were imprisoned. By the tenth anniversary of the "Gdansk Agreement", Walesa was out of prison and communism in Poland was faltering (as well as in all of Eastern Europe and Russia). Walesa's primary biographer tributes him as "an epochal figure, who shaped a country's struggle for sovereignty and freedom, played a central role in the collapse of communism and established the contours of his country's new vibrant democracy and free market economy." Lech Walesa achieved great goals through peaceful ideas. 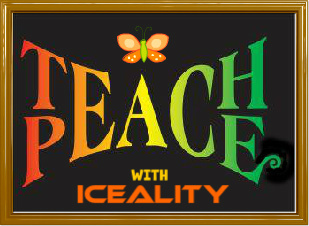 Author of War and Peace, Tolstoy is considered one of histories greatest thinkers on the issue of World Peace. He wrote many articles on the subject of peace -- some involve actual letters from soldiers seeking advice. His message to soldiers still rings true: "You are a soldier...you have been brought to 'pacify'...it has been instilled in you that you are not responsible for the consequences of your shots. 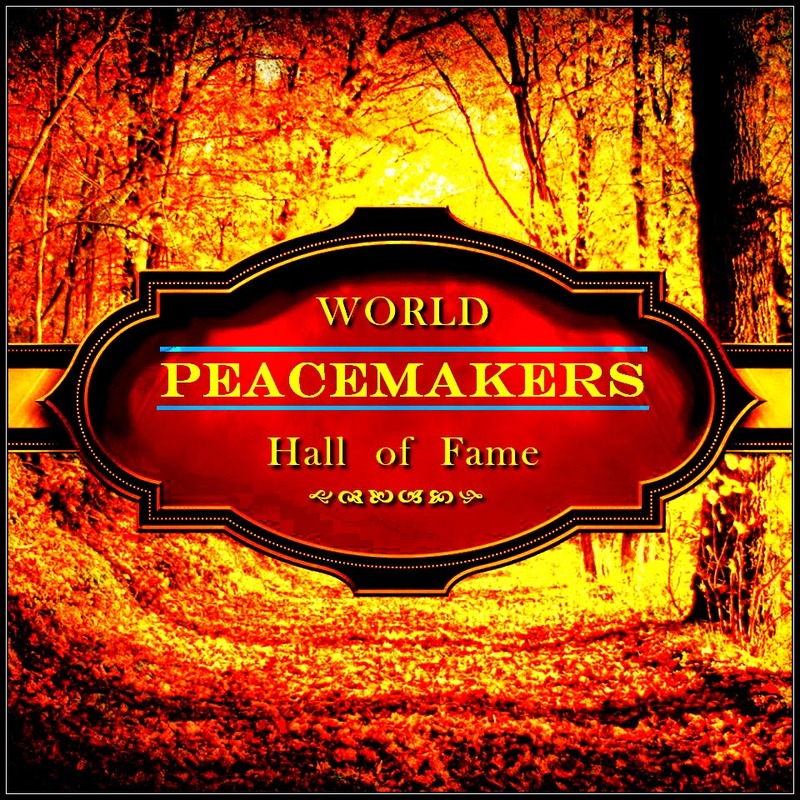 But you know that the man who falls bleeding from your shot is killed by you and by no one else..."
Builders of the "Worlds Children Peace Monument" (WCPM) and the "Great American Peace Trail". The noted Cleveland husband and wife team are recognized for their pioneering work in the Environmental Art Movement to help create a more sustainable, equitable and peaceful World in modern times. Through their international advocacy and educational activities promoting from a cultural perspective, the Jakupca’s have contributed to the revitalization of cultural and environmental diversity, and the strengthening of local communities and economies worldwide. In 1987, by founding the International Center for Environmental Arts (ICEA) at the historic ARK in Berea, they have combined their expertise in ecology, art and culture to really unravel the evolutionary dynamics of humanity. 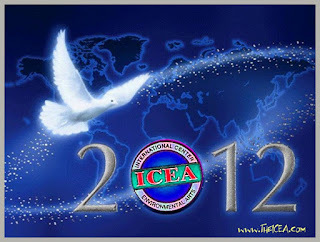 Their original 'Theory of Iceality on Environmenta Arts' , is the first fundamental change in developing a Culture of Peace in over 2000 years. The Theory underscores Nature's view about the integrative universal process of freedom and is the first to connect not only Man, but all Living Things (Human, Plant and Wildlife Kingdoms) to achieving a sustainable global Culture of Peace." In the early stages of her life, she was fascinated by the stories of missionaries. At the age of 18, she joined the Sisters of Loreto in Calcutta (Now, Kolkata) in order to start the charity works and spread the message of love in the world. 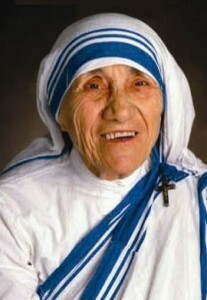 Sister Teresa became Mother Teresa on 24th May 1937. She taught from 1931 to 1948. The condition of the poor people outside the convent school where she was teaching were utterly bad. It, indeed, hurt her very deeply. She understood the need of the hour to help the destitute. With courage and divinity, she had started an open-air school for the slum dwellers of Calcutta. She did not stop with the service of teaching the poor children. She had also taught the adults and gave medical treatments to the ill patients by providing the basic amenities such as hospitals and clinics. She has been better known for starting off “Missionaries of Charity” with her pupils. Shishu Bhavan, establishment of center for AIDS patients and many Homes had also been started for the orphanages. Her service is still being followed in many parts of the world. She is an ideal person to be a good social worker and set as an example to the entire world as the icon of peace and love. Tied to a single bullet. He said "give peace a chance,"
To the unwinds of a rope. Written as part of the groundbreaking ceremony for the Parma Peace Stone on International Peace Day, Sept 21, 2012 at South Park, Parma Ohio. American Cultural Ambassadors honored with "Freedom Award"
Several prominent citizens of the Cleveland's Ethnic Community were honored with the “FREEDOM AWARD” July 18 by the American Nationalities Movement at the group’s annual Captive Nations Dinner, held at the Toscana Party Center in Cuyahoga Heights. About 160 People attended the event. The American Nationalities Movement has chosen American Cultural Ambassadors and husband and wife team David and Renate Jakupca for the 2012 Freedom Award "in recognition of their pioneering work in the Environmental Art Movement to help create a more sustainable and equitable world. 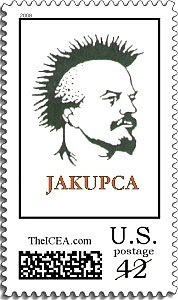 Through their international advocacy and educational activities promoting from a cultural perspective, the Jakupca’s have contributed to the revitalization of cultural and environmental diversity, and the strengthening of local communities and economies worldwide." Also honored was Parma Municipal Court Judge Kenneth R. Spanagel for his active and life long role in local ethnic communities. When future Cleveland Mayor Ralph Perk launched the American Nationalities Movement in 1959, dozens of nations lay trapped behind what was then called an Iron Curtain of communism. For years, with leaders like Senator George V. Voinovich, the Cleveland-based group lobbied and petitioned on behalf of people unable to speak for themselves. Most of the original “captive nations” — including Hungary, Poland and Lithuania — are now independent democracies. But the group’s president, Judge Ralph J. “Rocky” Perk Jr., insists its ideals and goals remain as timely as in his father’s day. “We are honored and deeply humbled to receive this award," the Jakupca’s e-mailed President Ralph Perk Jr. upon learning of their selection. "It is a special privilege to receive this honor from the American Nationalities Organization that has as its aim the fostering of both scientific and spiritual values on a worldwide level”. "We are profoundly grateful to the American Nationalities for recognizing and celebrating the value of scholarship and the importance given to the interchange and balance between scientific advancements and spirituality, and for the opportunity the prize gives for intercultural and inter-generational exchange," they continued. "Conscious of the list of scholars who have previously received the Freedom Award, we thank you with great pleasure, gratitude and humility." ABOUT: "David and Renate Jakupca have combined their expertise in ecology, art and culture to really unravel the evolutionary dynamics of humanity,” said Patrick Cahill, Board member of ICEA. 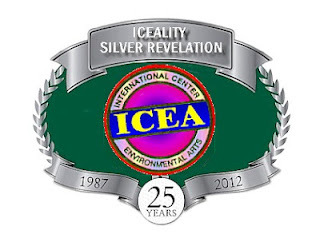 "It is fitting that on the ICEALITY SILVER REVELATION, the 25th anniversary of ICEA, that they receive this award and underscore humankind's view about the integrative nature of the process of freedom and peace for all." 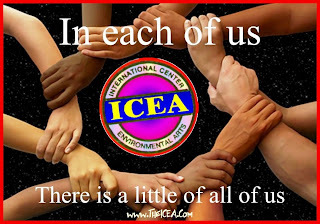 Together, the Jakupca’s founded the International Center for Environmental Arts (ICEA) in 1987 to meet the compelling needs of ordinary citizens for access to current, balanced, understandable information about complex global issues. Today, the International Center for Environmental Arts (ICEA) is a force for socially responsible activity as stated clearly in its mission statement: “ICEALITY” or "Theory of Iceality on Environmental Arts" - to assist in the understanding of the relationship between Humans and their Environment through Arts and Culture while ultimately promoting a sustainable global culture of peace network.” Over the years, ICEA has gained a reputation for excellence based upon a unique library of specialized and current information on global importance and a wide range of imaginative programming and collaborations with other organizations to meet the needs of a broad constituency. With affiliates across the globe, the ICEA supports the United Nations Millennium Development Goals and Code of Ethics and a range of programs that strengthens them. 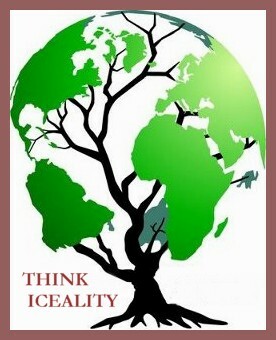 It supports research, information sharing and effective action throughout the global environmental arts network. At the ARK in Berea, David Jakupca has for the past four decades, been a highly vocal scholarly leader that has used the Arts as a tool for social change. Major institutions have christened him as the "Spiritual Father of the Environmental Art Movement," for his pioneering work on the Theory of Iceality. Renate was born in Austria , and as director of ICEA , she is committed to developing the potential of the arts to reach ordinary people, bringing them clear information about the complex challenges we all face. Her work has taken her to the past 9 U.N. Conferences in Europe, the Middle East, Asia and Africa .. One successful approach Renate developed together with her partner was to re-cycle huge quantities of information generated by the United Nations’ conferences around the world, and to make it accessible in the form of presentations and exhibits. David and Renate Jakupca have been married for 39 years and, in all that time, have excelled in their commitment to the Greater Cleveland Community and beyond. 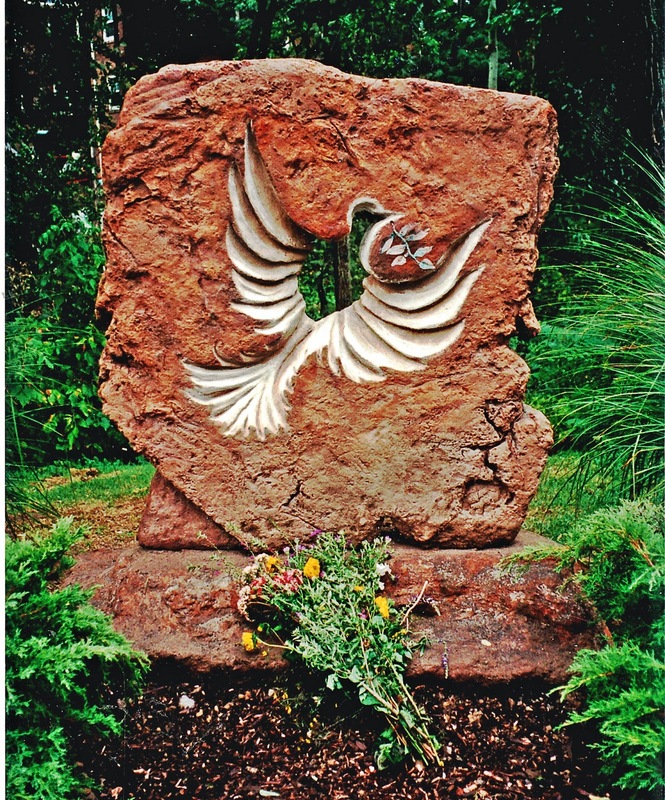 What they consider their most important contribution, is the Worlds Children Peace Monument (WCPM). The WCPM serves as a multicultural peace milestone and, in time, will become the largest monument dedicated to Global Peace for all Children. In America , it is the backbone of the coast-to-coast Great American Peace Trail. Together, they have won many honors including from the United Nations, the Nelson Mandela Leadership Award, and TIME Magazine as one of their 2000 Millennium "Heroes of the Planet". 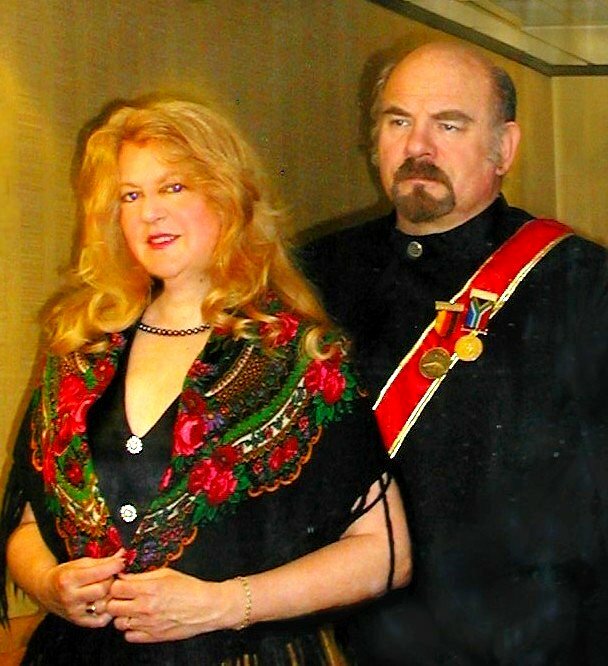 David and Renate have been appointed American Cultural Ambassadors when they represented the United States at EXPO2000 - the World's Fair in Hanover, Germany. In 2010, they were recognized as American Red Cross Community Heroes. 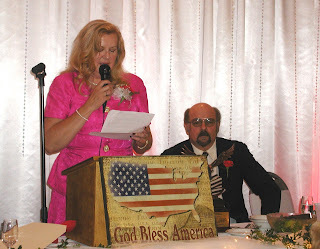 Both are officers and members of many local ethnic clubs and organizations, including Clevelandpeople.com where David is the German Ambassador and Renate is the Austrian Ambassador to Cleveland . "Thank you for your recent letter and the accompanying materials about the impact of your exhibit, 'Endangered Spaces' for the AMERICAN CANVAS PROJECT . Environmental Art is extremely worthwhile and I am glad to hear that it is reaching a global audience." Jane Alexander, Chairman, National Endowment of the Arts, January 3, 1997. "David and Renate Jakupca have been the leaders in showing how the Theory of Iceality on Environmental Arts works -- how small changes can lead to big ones. It is particularly fitting that as they approach the zenith of their careers, it coincides with this year's award. They are universally recognized and have been the honored guests at an extraordinary number of lectures and symposia all over the globe celebrating the Iceality of Peace." 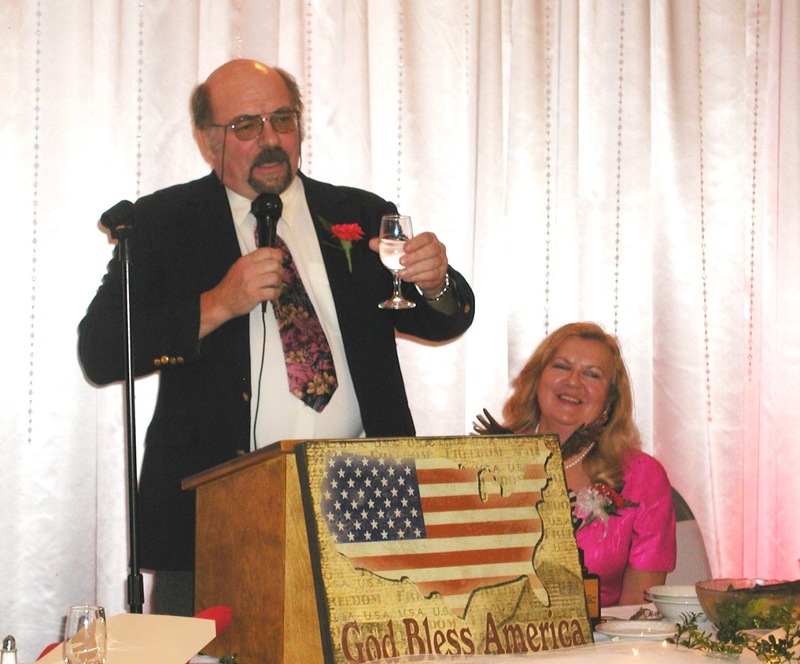 ABOUT: Parma Municipal Court Judge Kenneth R. Spanagel has served the Parma Municipal Court since 1988, having been elected and re-elected in 1987, 1993, 1999, 2005 and 2011. He succeeded his father, George Spanagel, and between them they have served as judges of that court since August 1969. Kenneth Spanagel has served as Presiding and Administrate judge of the court. He received his degree in communication studies from Northwestern University and his law degree from Case Western Reserve University School of Law. While president of the Parma Bar Association, Spanagel received the Ohio State Bar Association’s “Award of Merit” for Parma Bar Association activities. 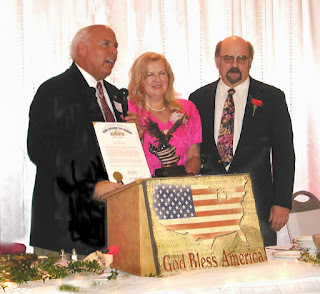 Spanagel is a past president of the Association of Municipal and County Judges of Ohio and received its “President’s Award” for distinguished service both to that association and the Judiciary of Ohio. He serves as one of three municipal court judges on the Ohio Criminal Sentencing Commission, having been appointed by the late Chief Justice Thomas J. Moyer. He is a member of the Ohio State Bar Association; Parma Bar Association; Cleveland Metropolitan Bar Association; Ohio Traffic Rules Review Commission sub-committee on the Multi-Count Uniform Traffic Ticket; and the Ohio State Bar Foundation. He is co-editor of the judicial publication The Chronicle. Spanagel frequently teaches law to judges, lawyers, and citizens. He is a long standing member of Divinity Lutheran Church, were he serves as a Sunday school teacher, singer during contemporary services, assisting minister, Communion assistant and children’s sermon presenter. Spanagel is a member of Deutsche Centrale (German Central) in Parma and the Cleveland American Middle East Organization. For many years he was a frequent speaker on the Slovak Radio Hour, sharing news of the community and ANM activity for freedom behind the Iron Curtain. Spanagel lives in North Royalton with his daughter, Lindsay, grandson Blaine, and dogs Roxie and Coco. I would also like to welcome some first time visitors and long time supporters, Joannie Miller, Bob Cunningham, Dieter and Christa Herbert, and most of all, my parents John and Hella Gottschick and my sister, Ilse Mayer who always believed in us. 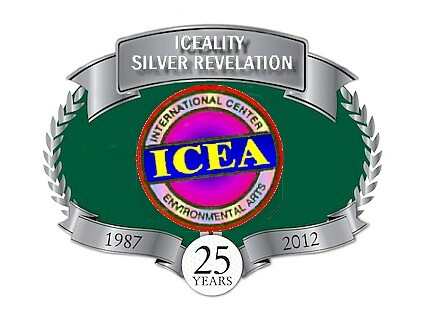 We are very proud as to where the International Center for Environmental Arts has brought us…..this year being our 25th Anniversary of our organization and the pronciples of the Theory of Iceality. The Arts are extremely crucial during adolescence as it is a time when kids are learning more about self awareness and their identity in the world. Our Peace Project with our Peace Stones can actually help children and teens express themselves, giving them a voice and making them feel more connected with other teens and children around the world. As we erect these Peace Stones throughout the world, together they will become the World’s largest Monument dedicated to Peace. Our children's COASTWEEKS project has been successful and ongoing for the past 17 years in Ohio. What we need to do now is to have the Coastweeks Project and the Great American Peace Trail be implemented in all 50 States. 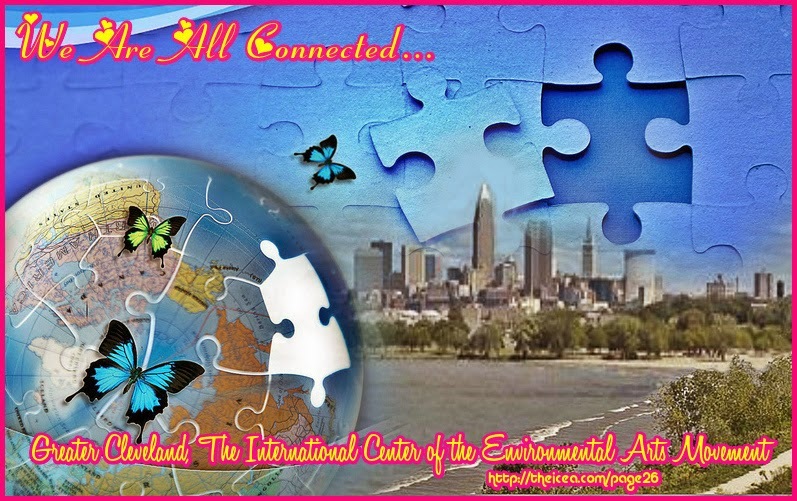 The International Center for Environmental Arts is an understanding of the relationship between humans and their environment through the Arts while at the same time cultivating a sustainable Culture of Peace and Iceality. 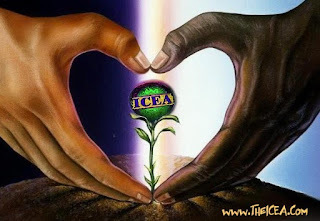 By bringing positive awareness, by communicating, by listening to people, ICEA will do everything possible to try and change people’s way of thinking for the betterment of society by bringing out the importance of sustainability in the future by means of alternative methods to survive for a much healthier environment. 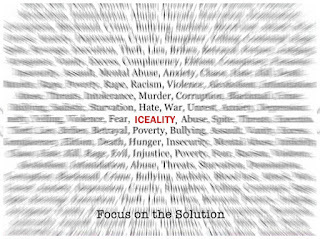 This world has so many cultures and all striving for the same goal and realizing we are ALL the same, reaching for what is really important in life and that is PEACE FRIENDS and harmony among us all.